Dr. Evangelista has been practicing in Scottsdale, AZ since 2007. He is the Chief of Orthopaedic Surgery at Honor Health Scottsdale Osborn Medical Center. 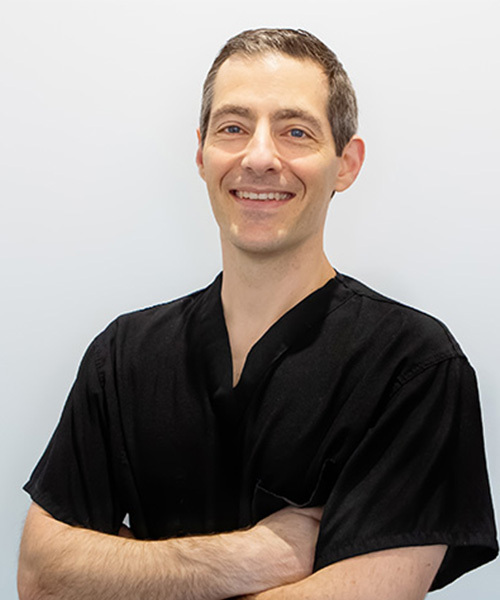 Dr. Evangelista is currently a Clinical Assistant Professor, Department of Orthopaedic Surgery, at the University of Arizona College Medicine-Phoenix. The focus of the practice is on the treatment of conditions that affect the cartilage, ligaments and tendons of the shoulder and knee. Dr. Evangelista routinely accepts transfers for the treatment of complex conditions. Dr. Evangelista’s peers have voted him a “Top Doctor” in PHOENIX magazine in 2010, 2013, 2014, 2015, and 2016. Advanced training in minimally invasive surgery, cartilage repair, shoulder replacement, and complicated reconstructions of torn ligaments and tendons. Clark J, Evangelista GT, Hunter R. Accuracy of Magnetic Resonance Imaging of the Knee in the Community Setting. American Academy of Orthopaedic Surgeons. San Francisco, CA, Feb 2012. Evangelista GT. Proximal femur fractures. AO Basic Course. Scottsdale, AZ. January 2010. Evangelista GT. Arthroscopic rotator cuff repair. Smith and Nephew Shoulder Arthroscopy Course. Boston, Massachusetts, October 2009. Evangelista GT. Total knee replacement. Scottsdale, AZ. January 2009. Evangelista GT. Arthroscopic rotator cuff repair. Smith and Nephew Shoulder Arthroscopy Course. Tucson, AZ, October 2008. Evangelista GT. Arthroscopic rotator cuff repair. Smith and Nephew Shoulder Arthroscopy Course. Tucson, AZ, October 2007. Evangelista GT. The biology of fracture healing. AO Basic Course. Scottsdale, AZ. January 2008. Evangelista GT. MRI: fact or fiction? Department of Orthopaedic Surgery, University of Arizona College of Medicine, Tucson, AZ, June 2007. Evangelista GT. Performance enhancing drugs in athletics. Department of Orthopaedic Surgery, University of Arizona College of Medicine, Tucson, AZ, May 2007. Evangelista GT. The meniscus: biology, mechanics, and clinical relevance. Department of Orthopaedic Surgery, University of Arizona College of Medicine, Tucson, AZ, December 2006. Evangelista GT. Shoulder Instability. Department of Orthopaedic Surgery, University of Arizona College of Medicine, Tucson, AZ, November 2006. Evangelista GT. Retrospective analysis of the effects of obesity on total knee and hip replacement. Department of Orthopaedic Surgery, Hospital for Joint Diseases, New York, NY, May 2006. Evangelista GT. Obesity and total joint arthroplasty. Department of Orthopaedic Surgery, Hospital for Joint Diseases, New York, NY, December 2005. Evangelista GT. Steroids and sports. Department of Orthopaedic Surgery, Division of Sports Medicine, Bellevue Hospital, New York, NY, January 2004. Evangelista GT. The diagnosis and treatment of elbow fractures. Department of Orthopaedic Surgery, Hospital for Joint Diseases, New York, NY, January 2004. Evangelista GT. The evaluation and management of tibial plateau fractures. Department of Orthopaedic Surgery, Hospital for Joint Diseases, New York, NY, October 2003. Evangelista GT. (Thesis Defense) The synthesis and characterization of linear and dendritic polymers as precursors to borosilicates and phosphosilicates. Department of Chemistry, The Pennsylvania State University, University Park, PA, April 1997. Levine B, Evangelista GT. The use of a topical a skin adhesive for wound closure after hip fracture surgery. Submitted 2016. Evangelista PJ, Evangelista LM, Evangelista GT, Ruth JT, Mills JL Sr. Delayed complete limb ischemia following a closed tibial shaft fracture. Am J Orthop (Belle Mead NJ). 2013 Dec;42(12):569-72. Hardy JC, Evangelista GT, Grana WA, Hunter RE. Accuracy of magnetic resonance imaging of the knee in the community setting. Sports Health. 2012 May;4(3):222-31. Evangelista PJ, Evangelista GT. Dyspareunia associated with a pelvic digit. Journal of Surgical Case Reports, 12:7, Dec 2011. Evangelista GT, Fulkerson EF, DiCesare PE. Surface damage to an Oxinium femoral head prosthesis after dislocation. Journal of Bone and Joint Surgery (Br), 89(4):535-7, April 2007. Evangelista GT, Zuckerman JD. Total knee arthroplasty in a patient with quadriceps paralysis secondary to poliomyelitis: a case report. American Journal of Orthopedics, 32(12):593-7, Dec 2003.